Are you a website designer or web developer? If yes, then, Site5 web hosting claims to be the one for you, especially with a tagline that says ‘Built for Designers and Developers’. But, what about bloggers and non-technical people that are looking for a good web hosting company for their website? After reading some customer reviews about Site5 though, you will realise that this host is also suited for non-technical webmasters as well. However, Site5 does not offer as many features as required for site developers and designers at the price quoted for their various hosting plans. In this review, we shall go through the features offered by Site5, their hosting plans, and their pros and cons. Since its inception in 1999, Site5 has gained a stronghold in the web hosting industry. The fact that they exist even today shows that they have kept pace with the constant evolution the technology industry has been undergoing. Headquartered in Denver, Site5 has a team of 121 highly skilled members (on-staff) with all of them working remotely to support the ‘Go Green’ initiative. This team is spread across different countries of the world, making it relatively easy for customers to interact with them and get timely help. Site5 is ‘Safe Harbour Certified’ as per the US Department of Commerce to ensure streamlined privacy protection between US and EU (European Union). It is also a BBB (Better Business Bureau) accredited host (since 2009) with a rating of A+ (which is the highest possible). That indicates Site5’s commitment towards resolving any consumer complaints rapidly and effectively. Let’s take a look at the features offered by Site5. Site5 offers a very high uptime of around 99.9%, which is why most of its customers consider it as an extremely reliable web host. In fact, they are one of the rare web hosts who provide uptime guarantees of 99.9%. This means that if your server is not available (due to unscheduled outages) for the prescribed percentage of time within any month, you will get pro-rated credit from Site5 for that time. They do not overload their shared servers with too many hosting accounts even though the server capacity is immense. They are known for providing guaranteed resources and guaranteed performance. Site5 offers a wide choice of server locations in different countries like the US (10), Canada (3), Brazil (2), UK (1), Australia (1), The Netherlands (1), Romania (1), India (1), Singapore (1), China (1) and France (1). This means you can select the server nearest to your target audience. This will make your website work faster for them. For security, Site5 allows subscribers to use their shared SSL certificate, free of cost. This helps make your website more secure and reliable, but you can also purchase your own, dedicated SSL certificate if needed. Site5 ensures regular, automatic backups (at night) of every hosting account. These backups are stored securely in separate files. It is also possible for you to download your backup and have immediate access to your own archived set of files. This is very useful if your website is hacked or compromised in some other way and you lose the files on your web server. They also offer malware protection to actively monitor your website (round the clock) for any malicious activity. If it finds something fishy, it notifies you and cleans up your site proactively. This protection service is available at an additional cost of $49.99 per year for each website. The good thing about Site5 is that they don’t outsource their customer support. It is completely in-house, with a team of highly skilled, dedicated technical experts that frequently troubleshoot hosting issues and problems. Site5’s 24/7 support is very reliable, especially since they guarantee the response time. This implies that if you do not receive any response from the Site5 support team within 6 hours of you raising a ticket/issue, you are eligible for $1 credit. In general, the support team is quick to reply to you with plausible solutions. The support staff will investigate any issues encountered, identify the problem, find a solution, test it, and then they will send a full explanation back to you once they are satisfied with the resolution. 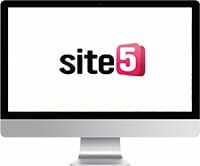 Additionally, the Site5 management team (management@site5.com) is easily accessible for any complaints or issues that you may have. You can always reach out to them directly if there is any unsatisfactory experience with the support staff. Site5 offers a customised version of the industry standard cPanel, termed the SiteAdmin, to make it easier for customers manage their hosting accounts. With SiteAdmin, you can quickly access all the account services, as well as the tools required to configure, setup, or even make changes to your hosting, and maintain your website. Through SiteAdmin, you can easily access site tools, server information, manage domains, manage MySQL databases, setup FTP accounts, check site stats, and even install various third-party scripts and services for free. With the MultiAdmin feature enabled for certain hosting plans, you can manage multiple websites with each having a dedicated control panel for better security. Site5 offers a decent money back period of 45 days for all their shared hosting and reseller hosting plans. For VPS hosting plans, they only offer a 15-day period during which you can opt-out of their hosting services and claim a refund. However, this money back guarantee is offered on top of a 30-day free trial period. Their ultimate aim is to ensure that their customers are 100% satisfied with their hosting services. All the plans offered by Site5 comprise of unlimited disk space, unlimited bandwidth, disaster recovery backups and free migrations from other hosting services to their servers. With every plan, you get to select the location of your server for hosting your website. Costs $11.95 per month (1-year subscription) or $12.95 per month (monthly subscription) or $10.95 per month (2-year subscription) with unlimited websites, suitable for 100,000 visits per month. Some special features include a free dedicated IP and a MultiAdmin to provide a separate control panel for each of your websites for easy maintenance. All VPS plan subscribers are entitled to one free IP address (for SiteAdmin) or two free IP addresses (for standard cPanel), with more IP addresses available with each costing $3. Site5 offers their full management services for all these plans, including monitoring, updates, and security. You also get shared SSL certification for better security. Site5 makes use of Xen-based VPS technology that functions like a dedicated server with guaranteed disk space, bandwidth, and resources as allocated in your plan. Site5’s RAID 10 storage provides the ideal combination of website hosting performance, availability as well as redundancy. For all fully managed Virtual Private Server hosting plans, subscribers get a choice for the standard control panel (cPanel) or the SiteAdmin/MultiAdmin (which is their easy-to-use, customised cPanel). You can get professional reseller hosting solutions from Site5 as well. They offer fully anonymous hosting so that your clients cannot identify you as a reseller. All reseller hosting plans include three IP addresses, free billing software, custom DNS nameservers, a domain reseller account, and unlimited resold accounts. Site5 also offers a few cloud hosting plans under Cloud VPS, Cloud Reseller, and Cloud Web Hosting categories. Despite their claims of being built for developers and designers, Site5 doesn’t offer that many features to attract developers, unlike SiteGround that does provide a lot of features geared towards designers. While Site5 would be a great hosting provider for people looking to start a blog, and beginner webmasters, as well as small start-ups and development teams, it might not fit the bill if you’re a larger organisation looking for specific feature sets. What works in its favour is that you can try out Site5’s services using the 30-day free trial and 45-day (or 15-day) money back guarantee. Have you used Site5 hosting services? What was your experience with them? Let us and our readers know in the comments below, and thanks for reading! Why not give Site5 a go?! Absolutely useless! on the migration from IX web hosting I have lost a domain name I have had for years. I now have problem with another web site which is down (losing revenue everyday) I have been contacting their support and keep getting the same message ‘someone will be in contact with you in the next 24 hour’ its like they sign they have in bars ‘free beer tomorrow’ it never comes. Would advise stay away from these cowboys because when you need their support, they are not fit for purpose. You have been warned.